It’s been a long time since my last post. The main reason for this is that I have been busy working on Slow Norfolk, a new guide for Bradt that is scheduled for publication early next year. Rather than a new edition of Slow Norfolk & Suffolk, that guide will become two separate books in the future: Slow Norfolk and Slow Suffolk. Naturally, there will be a degree of cut and paste involved but, as well as a fresh look and a new emphasis – less in the way of listings, more in the way of a personal take on the county — there will be lots of new material that celebrates that which is strange, quirky and particular about the county. For a taster of the sort of thing that Slow Norfolk will contain, here’s a snippet about a certain German physicist’s brief sojourn in north Norfolk. A couple of miles southeast of Felbrigg Hall is the village of Roughton on the Norwich to Cromer road. Although the village is unremarkable, Roughton Heath just to the north was the unlikely residence of Albert Einstein for a few weeks in 1933. The celebrated German physicist was brought here under tight security to live in a small hut on the heath after fleeing Nazi Germany. 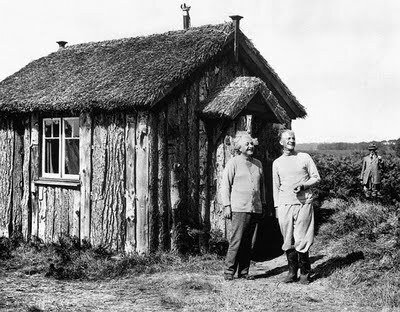 Whilst living in his modest hut Einstein continued with important work that would later be put to use developing the world’s first atomic bomb. The scientist also found time to pose for a sculpture by Jacob Epstein. It was this brief episode by the Norfolk coast that provided inspiration for Philip Glass’s opera Einstein on the Beach. A blue plaque commemorating Einstein’s short-lived residence on the heath adorns the wall of the New Inn in Roughton village. The whereabouts of the hut itself is not known. This entry was posted in History, Norfolk, Travel and tagged Bradt, Cromer, Einstein, huts, Roughton, Slow Norfolk. Bookmark the permalink. Good luck with the books Laurence. Had no idea that Glass’s work inspired by Einstein’s visit to Norfolk. Great story. (and very nice hut). Many thanks. To be honest, I had no idea about the inspiration for Glass’s opera until recently. Yes, it’s a nice hut – I want one like that! All the best for your book, Laurence. I’m very much looking forward to it! Wishing you a relaxing Sunday. Thanks a lot for the information about Einstein. Just three days ago I went for a long walk around Felbrigg Hall Estate, I look forward to explore more of the surroundings.